I was again interviewed on the mysterious matter of the Loch Ness Monster by Bruce Collins and you can listen into that tomorrow. He broadcasts on West Coast People's Radio. Who are the Monsters of Loch Ness? With the upcoming book on Frank Searle, I was minded to follow up on a few things in advance to perhaps raising awareness of this topic. When you think of Frank, you think of personality clashes, vendettas and even vandalism and violence. However, the perhaps not so surprising thing is that this little piece of monster hunting history was only the most publicised aspect of a general thread that has run through the decades. In other words, monster hunters and ex-monster hunters are not some cosy conclave of nice but eccentric folks akin to bird spotters, but rather a microcosm of the all too inevitable failings of human nature. To the unwary, Loch Ness is almost like some surreal real life fairy tale, tiny hamlets surrounding a huge expanse of water, exhibitions, tourist shops, whisky and the occasional ‘Monster Hunter/Researcher’ running around in search of the creature(s). To the tourist, a huge farce is played out as the so called ‘experts’ expound their own personal theories, almost demanding to be elevated to the position of world’s number one and sole expert on the matter. Away from the tourists, these same ‘experts’ (they are indeed the only one’s who class themselves as such) appear to be hell bent on destroying not only the opinions of others but also on succinct character assassination. The reality with Loch Ness research is that it is a complete and utter mess, sighting reports (old and new) held by some and other valuable information is selfishly withheld by those who choose to keep it from the public domain, as these folks absurdly believe that their personalities are bigger than the tradition itself of the Loch Ness Monster. Virtually everything that can be postulated about the Loch Ness creature(s) has been printed in countless books, magazine articles and newspaper columns, therefore I do not intend to dwell on the subject, other than to say until serious and sensible cohesion can be brought to bear on research matters then the real search for the truth will never progress. 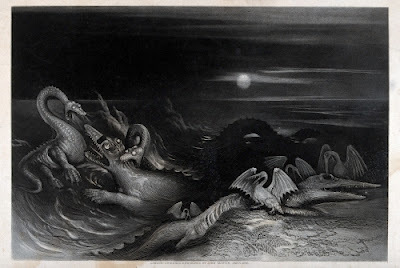 As for ‘lake monsters’ such as those believed to inhabit Loch Ness, perhaps the real monsters are of the human kind, whatever it is or they are that inhabit Loch Ness, they are not as mysterious as the personal politics involved in research there. Seals, boat wakes, eels, standing waves, floating logs, or just plain old hoaxes, Loch Ness will continue to be the epicentre of Dracontology and Cryptozoological matters, a great shame it could not set the ideal academic study and research example. Loch Ness is indeed the tip of the Dracontology iceberg, but its also drifting towards oblivion, a Cryptozoological subject which may be cynically dismissed by new researchers as ‘untouchable’. When Paul speaks of those who wish to be seen as the "world’s number one and sole expert on the matter" or are "hell bent on destroying not only the opinions of others but also on succinct character assassination" I can readily empathise with that, having experienced it first hand for myself on the new platform of Internet forums. Whether it is the same people involved in 2016 as in 2001 is not a matter I wish to pursue in this article. The point is that the problem has not gone away and it is appropriate that Paul is the author of this new book on Frank Searle entitled "The Monster Hunter - The True Story of Nessie and Frank Searle". That phrase, "the true story" implies there are things about Frank Searle that have been either omitted, exaggerated or just plain fabricated. What those are remains to be seen, but I have spoken before about Frank's unpublished second book, which was pulled after protests by Adrian Shine. That book was, until recently, available online. I note that link has gone dead, so you can now download and read the PDF from my own archives at this link. It is a publication you should take with a pinch of salt given the high tensions of the period, but to state it is wholly fabricated is something that should also be taken with a pinch of salt. Apart from a couple of less than flattering claims made against a prominent Nessie sceptic often seen on cryptid Internet forums, the one that intrigued me most was the claim that Tim Dinsdale was at Loch Ness in April 1960 with another man with whom he later had an argument and was seen bundling into his car after he collapsed. This sounds fanciful but is based on what a claimed local eyewitness who approached them told Searle years later. The fact that no one has stepped forward saying they were that mystery man seems to mitigate against it. Such are the claims and counterclaims of the Frank Searle story. As a prelude to Paul's book coming out, I decided to look again at the infamous "petrol bomb" incident of August 1983. What we know of this mainly comes from those who were Frank Searle's enemies. Since the phrase "the victors get to write the history" is a truism even in the Highlands, I decided to look beyond these people. A search of the newspaper archives at the invaluable National Library of Scotland turned up two articles. The first is from the local Inverness Courier dated the 23rd August 1983. Click on the images to enlarge for reading. The second comes from the Aberdeen Press and Journal of the 22nd August 1983. Clearly, something happened on the 21st August 1983 when somebody lobbed a lit plastic bottle filled with petrol at a boat and somebody had daubed words against Adrian Shine on the walls of Urquhart Castle two days before. The Inverness Courier took a neutral stance in talking about an "alleged petrol bomb attack" and did not name any suspects. The Press and Journal had a similar approach but also mentions police involvement and the vandalism at the castle. However, things get obscure beyond these newspaper clippings. A further search makes no mention of the outcome of this police investigation and no mention of Frank Searle. One can only presume the investigation fell through due to lack of evidence. Mike Dash, Fortean researcher, wrote on this incident as he was there as a volunteer with the Loch Ness and Morar Project. He did not witness the incident at 5:30am but was there to observe the consequences. He said a female volunteer identified the man who threw the bottle from a photo of Frank Searle, but nothing came of this important witness evidence. Combining this with Searle's account of the incident in his unpublished booklet, it would seem the police quickly visited Frank Searle at his Foyers base only to find him painting the ceiling of his small exhibition. They also asked him if he would take part in an identity parade, to which he refused since he claimed he was too well known to allow an unprejudiced procedure. Searle's booklet makes no mention of the castle incident, let alone making a defense against it. Though he does argue against the petrol bomb incident, claiming that the idea was stupid since a molotov cocktail had to be made of glass and the waves were so high that morning they would have extinguished any flame. A final source was a friend of Frank Searle by the name of Graeme Caisteal. He countered Mike Dash's account by claiming Frank had a prosthetic foot from his army days which would make it nigh impossible for him to clamber up to the castle and daub the walls. Perhaps, but he also said that the police found the engine of Frank Searle's boat to be stone cold and that there were a group of tourists there to vouch as alibis. Frank Searle claimed he had an idea who perpetrated the bottle attack and claims he was set up. He does not name the person and we are left in the awkward position where Frank Searle is the obvious suspect, but evidently not obvious enough to press charges. Counter arguments can be made against such arguments as parties classed as monsters by the other party clash with all teeth bared. As for me, I will simply await Paul Harrison's book to see what it has to say about that day on a shingle beach thirty two years ago. I do hope no one tries to block this book as they did with Frank Searle's. Meanwhile, the envenomations will continue as personalities and agendas trump research in the great Loch Ness Monster debate!